Current advance of the Indian Monsoon indicated by the green line vs typical historic advance indicated by the dashed red line. Image source: India Meteorological Department. The Indian Monsoon arrived in Sri Lanka on June 2nd, 8 days late, with extreme force. Dumping excessive rainfall even for a typically powerful event, it forced 2,500 to flee and resulted in the loss of 22 souls. There it stalled, battening into a Bay of Bengal moisture flow that hasn’t budged since May 23rd. By today, June 5th, powerful storms should be dumping rain over a wide swath including the entire southern tip of India, almost all of the waters between Myanmar and the Tamil Nadu and Andhra Pradesh coasts, and over most of Bangladesh. But in the satellite shot only scattered storms are visible where powerful, wall-to-wall squalls should now cover an impressive swath. By this time last year, more than a third of India was obscured by cloud. Today, the skies of this nation of 1.25 billion people are ominously clear. The steely-gray aerial tint of coal ash smog is the most impressive feature in an otherwise open expanse from the northwest deserts to the southeast coast. A massive zone showing only sparse hint or hope of rain. Even Sri Lanka seems mostly cloud-free. The monsoon and, more importantly, the crop-essential rains it brings are walled out, pushed into the margins by El Nino and some of the hottest global temperatures on record. 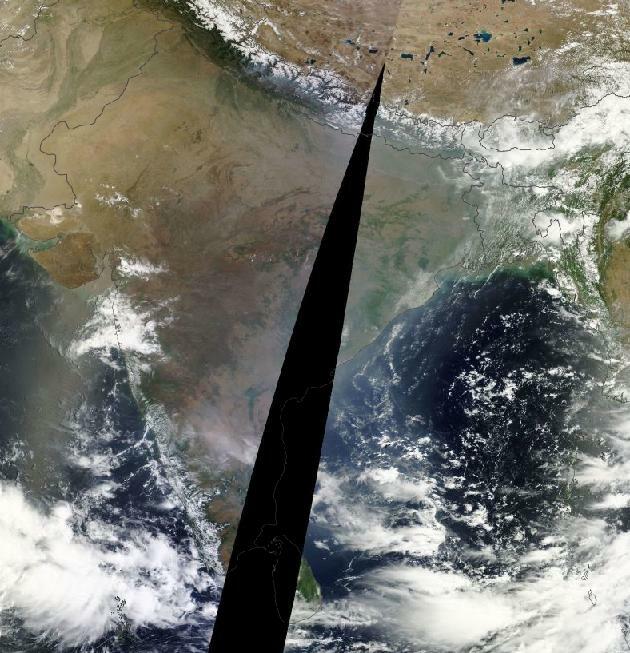 Blazingly clear skies laced with ominous coal ash over India during a time when monsoonal storms usually advance. Image source: LANCE-MODIS. Forecasts indicate that some of the long-delayed rain could arrive to the coast by tomorrow through Sunday. Sparse comfort to sweltering interior sections that may not now see the cooling monsoon until after July 1st. In the north, the heat and drought just builds and builds. Jaipur recorded its highest temperature in 33 years on Thursday at a scorching 46.3 degrees Celsius (115.3 F). Meanwhile, New Delhi hit a new record high for the day of 45 C (113 F). Forecasts for New Delhi on Saturday and Sunday show the potential for even more extreme heat with temperatures projected to climb to 116 F. Over the coming ten days, the coolest is expected to be Friday of next week at 109 F.
The continued delay of monsoonal rain combines with record heat throughout northern and western sections of India to enhance risks of drought and loss to crops. Heatwave conditions have already reduced Lychee fruit crop yields by 40%. But an extended stalling of the monsoon and ongoing heat could result in increased damage. Atmospheric thickening that comes with such extreme heat can also spur intense rain and hail events causing another kind of damage to crops. So a flash switch from heat to heavy storms like those seen earlier this week in Sri Lanka may not be so much of a boon as a terrible jolt to affected lands. This year’s monsoonal delay and related extreme weather were likely amplified by a combination of record atmospheric heat due to human-caused greenhouse gas forcing and a growing and strengthening El Nino. In April, global atmospheric temperatures hit new record highs of +.91 C above 1880s values even as El Nino rapidly gained ground in the Pacific through May. Multivariate ESNO Index values catapulted to +0.93 in May hitting the seventh highest values on record for the month and pushing the current El Nino into Moderate-Strong range for this time of year. During previous years, similar high values resulted in strong El Ninos on 3 of 5 occasions in the climate record. So historical indicators point toward a 60% chance of a strong event emerging by later this year. The long anticipated breakthrough to El Niño conditions in 2014 is clearly under way, leading to the next question of how big it will get. Of the 10 nearest-ranked April-May values, five had clearly come up to this level over the previous three months. Among those five, four continued at El Niño levels through the rest of the year, while one (1993) dropped back to borderline neutral conditions by the end of the year. One (2002) ended up as a weak-to-moderate event, while the other three (1957, 1987, and 1997) are classified as strong El Niño events in the MEI sense. In other words, the simple-minded odds for El Niño remain at or above 80% through the remainder of 2014, and are consistent with previous discussions on this website. The odds for a strong El Niño are perhaps slightly higher than before, somewhere around 60%. Meanwhile, the official NOAA forecast is more cautious, with model interpretations pointing to a higher likelihood for a moderate El Nino during 2014. El Nino probability graph. Image source: CPC. Overall, chances for evolution to full-blown El Nino rose significantly with today’s forecast now showing a 70% chance for El Nino development by this summer and nearly an 85% chance for El Nino development by Fall-Winter. Regardless of El Nino strength, such an event is likely to have broad-ranging global impacts in the context of human-caused warming. For India, history shows numerous cases of severe monsoonal disruption during strong, moderate, and, recently, even weak El Nino events. In addition, record high atmospheric temperatures enhance extreme drought and flood potentials by amping up the hydrological cycle and thus increasing the rate of both evaporation and precipitation. Storms, where they do occur tend to be both tall and abnormally powerful under current human-warming related stresses even as droughts tend to develop with higher velocity and to persist for longer periods. It is possible, due to both changes to the hydrological cycle and to atmospheric circulation, that the Indian monsoon has become even more sensitive to the El Nino pattern under current human-caused warming. 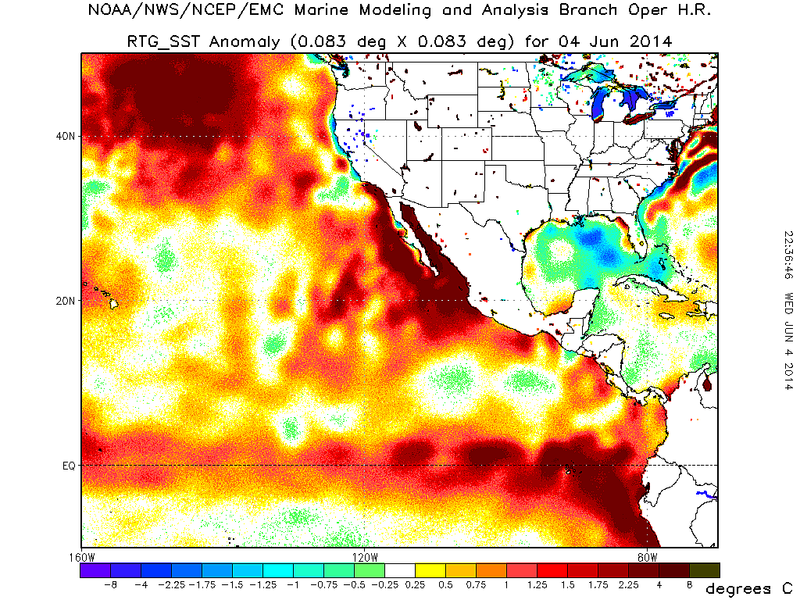 This year’s monsoonal delay with El Nino just emerging shows an almost instant response to the forcing coming from increased temperatures in the Equatorial Pacific. As such, conditions of heightening threat for crop damage throughout a land where 1.25 billion people rely on the annual rains is a critical issue. Overall, the forecast remains for continued monsoonal delay and disruption, continued heatwaves and a likelihood for extreme rainfall and storms in the regions where the monsoon finally arrives. With El Nino conditions in place over the Pacific now, with atmospheric temperatures rising into record range, and with an official El Nino status likely to be declared by summer, this forecast is lent yet more certainty and urgency.